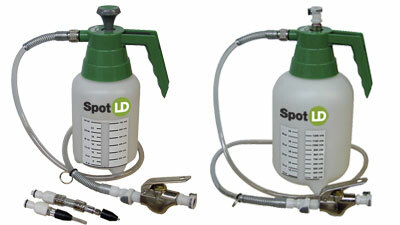 The SpotLD applicators come with a Palm Gun and Output Hose that has support springs at both ends. The quick disconnect at the hose end also allows for the Palm Gun to be removed at anytime. The removable Palm Gun provides for easy maintenance and fast change out with various tips. Hand Pump Applicators: are available in Liquid and Foam models.